Colombia ( /kəˈlʌmbiə/ kə-LUM-biə, or /kəˈlɒmbiə/ kə-LOM-biə), officially the Republic of Colombia (Spanish: República de Colombia [reˈpuβlika ðe koˈlombja]), is a country situated in the northwest corner of South America, bordered to the northwest by Panama; to the east by Venezuela and Brazil; to the south by Ecuador and Peru;  and it shares maritime limits with Costa Rica, Nicaragua, Honduras, Jamaica, Dominican Republic and Haiti. It is a unitary, constitutional republic comprising thirty-two departments. Since the 1960s, the country has suffered from an asymmetric low-intensity armed conflict. The conflict escalated in the 1990s, but since 2000 the conflict has decreased considerably. Colombia is ethnically diverse, the descendants of the original native inhabitants, Spanish colonists, Africans originally brought to the country as slaves, and 20th-century immigrants from Europe and the Middle East have produced a diverse cultural heritage. This has also been influenced by Colombia's varied geography, and the imposing landscape of the country has resulted in the development of very strong regional identities. The majority of the urban centres are located in the highlands of the Andes mountains, but Colombian territory also encompasses Amazon rainforest, tropical grassland and both Caribbean and Pacific coastlines. Ecologically, Colombia is one of the world's 17 megadiverse countries, and is considered the most megadiverse per square kilometer. Colombia is a middle power with the third largest economy in South America, and is part of the CIVETS group of six leading emerging markets. Its principal industries include oil, mining, chemicals, health related products, food processing, agricultural products, textile and fabrics, garments, forest products, machinery, electronics, military products, metal products, home and office material, construction equipment and materials, banking, financial services, software, IT services and the automotive industry. In 1835, when Venezuela and Ecuador parted ways, the Cundinamarca region that remained became a new country – the Republic of New Granada. In 1858 New Granada officially changed its name to the Granadine Confederation, then in 1863 the United States of Colombia, before finally adopting its present name – the Republic of Colombia – in 1886. 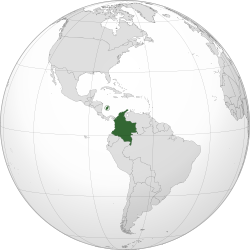 To refer to the country, the Colombian government uses the terms Colombia and República de Colombia. Due to its geographical location, the present territory of Colombia was a corridor of population migration from Mesoamerica and the Andes to the Caribbean and Amazon. The oldest archaeological finds are from the Pubenza and El Totumo sites in the Magdalena Valley 100 km southwest of Bogotá, dating from about 14,400 BCE. These sites correspond to the Paleoindian period (18,000-8000 BCE). In Puerto Hormiga and other sites, traces from the Archaic Period (~8000-2000 BCE) have been found. Vestiges indicate that there was also early occupation in regions like El Abra and Tequendama in Cundinamarca. The oldest pottery discovered in the Americas, found at San Jacinto, dates to 5000 - 4000 BCE. By 10,500 BCE, the territory of what is now Colombia was inhabited by aboriginal people. Nomadic hunter-gatherer tribes existed near present-day Bogotá (at El Abra and Tequendama sites) which traded with one another and with cultures living in the Magdalena River Valley. Between 5000 and 1000 BCE, hunter-gatherer tribes transitioned to agrarian societies; fixed settlements were established, and pottery appeared. Beginning in the 1st millennium BCE, groups of Amerindians including the Muisca, Quimbaya, and Tairona developed the political system of "cacicazgos" with a pyramidal structure of power headed by caciques. The Muiscas inhabited mainly the area of what is now the Departments of Boyacá and Cundinamarca high plateau (Altiplano Cundiboyacense). They farmed maize, potato, quinoa and cotton, and traded worked gold, emeralds, blankets, ceramic handicrafts, coca and salt with neighboring nations. The Taironas inhabited northern Colombia in the isolated Andes mountain range of Sierra Nevada de Santa Marta. The Quimbayas inhabited regions of the Cauca River Valley between the Occidental and Central cordilleras. Santa Marta was founded in 1525, and Cartagena in 1533. Spanish conquistador Gonzalo Jiménez de Quesada led an expedition to the interior in April, 1536, and christened the districts through which he passed "New Kingdom of Granada". In August, 1538, he founded provisionally its capital near the Muisca cacicazgo of Bacatá, and named it "Santa Fe". The name soon acquired a suffix and was called Santa Fe de Bogotá. Two other notable journeys by early conquistadors to the interior took place in the same period. Sebastián de Belalcázar, conqueror of Quito, traveled north and founded Cali, in 1536, and Popayán, in 1537; from 1536-1539, German conquistador Nikolaus Federmann crossed the Llanos Orientales and went over the Cordillera Oriental in a search for El Dorado, the "city of gold". The legend and the gold would play a pivotal role in luring the Spanish and other Europeans to New Granada during the 16th and 17th centuries. 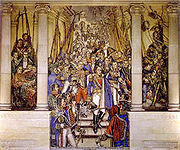 In 1549, the Royal Audiencia was created by a royal decree, New Granada was ruled by the Royal Audience of Santa Fe de Bogotá, which at that time comprised the provinces of Santa Marta, Rio de San Juan, Popayán, Guayana and Cartagena. But important decisions were taken to the colony from Spain by the Council of the Indies. Indigenous peoples in New Granada, experienced a reduction in population due to conquest by the Spanish as well as European-carried diseases such as smallpox, to which they had no immunity. With the risk that the land was deserted, the Spanish Crown sold properties to the governors, conquerors and their descendants creating large farms and possession of mines. In the 16th century, Europeans began to bring slaves from Africa. [Note 2]  To protect and exploit the indigenous peoples, several forms of land ownership and regulation were established: resguardos, encomiendas and haciendas. Repopulation was achieved by allowing colonization by farmers and their families who came from Spain. The 18th-century priest, botanist and mathematician José Celestino Mutis was delegated by Viceroy Antonio Caballero y Góngora to conduct an inventory of the nature of the New Granada. Started in 1783, this became known as the Royal Botanical Expedition to New Granada which classified plants, wildlife and founded the first astronomical observatory in the city of Santa Fe de Bogotá. In July 1801 the Prussian scientist Alexander von Humboldt reached Santa Fe de Bogotá where he met with Mutis. In addition, historical figures in the process of independence in New Granada emerged from the expedition as the astronomer Francisco José de Caldas, the scientist Francisco Antonio Zea, the zoologist Jorge Tadeo Lozano and the painter Salvador Rizo. Since the beginning of the periods of conquest and colonization, there were several rebel movements under Spanish rule, most of them were either crushed or remained too weak to change the overall situation. 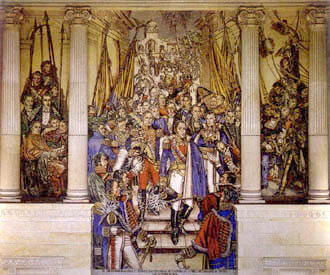 The last one which sought outright independence from Spain sprang up around 1810, following the independence of St. Domingue (present-day Haiti) in 1804, which provided a non-negligible degree of support to the eventual leaders of this rebellion: Simón Bolívar and Francisco de Paula Santander. A movement initiated by Antonio Nariño, who opposed Spanish centralism and led the opposition against the viceroyalty, led to the independence of Cartagena in November 1811, and the formation of two independent governments which fought a civil war – a period known as La Patria Boba. The following year Nariño proclaimed the United Provinces of New Granada, headed by Camilo Torres Tenorio. Despite the successes of the rebellion, the emergence of two distinct ideological currents among the liberators (federalism and centralism) gave rise to an internal clash which contributed to the reconquest of territory by the Spanish. The viceroyalty was restored under the command of Juan de Samano, whose regime punished those who participated in the uprisings. The retribution stoked renewed rebellion, which, combined with a weakened Spain, made possible a successful rebellion led by the Venezuelan-born Simón Bolívar, who finally proclaimed independence in 1819. The pro-Spanish resistance was finally defeated in 1822 in the present territory of Colombia and in 1823 in Venezuela. The territory of the Viceroyalty of New Granada became the Republic of Colombia organized as a union of Ecuador, Colombia and Venezuela (Panama was then an integral part of Colombia). The Congress of Cúcuta in 1821 adopted a constitution for the new Republic. Simón Bolívar became the first President of Colombia, and Francisco de Paula Santander was made Vice President. However, the new republic was unstable and ended with the rupture of Venezuela in 1829, followed by Ecuador in 1830. Colombia was the first constitutional government in South America, and the Liberal and Conservative parties, founded in 1848 and 1849 respectively, are two of the oldest surviving political parties in the Americas. Slavery was abolished in Colombia in 1851. Internal political and territorial divisions led to the secession of Venezuela and Quito (today's Ecuador) in 1830. The so-called "Department of Cundinamarca" adopted the name "Nueva Granada", which it kept until 1856 when it became the "Confederación Granadina" (Granadine Confederation). After a two-year civil war in 1863, the "United States of Colombia" was created, lasting until 1886, when the country finally became known as the Republic of Colombia. Internal divisions remained between the bipartisan political forces, occasionally igniting very bloody civil wars, the most significant being the Thousand Days' War (1899–1902). The United States of America's intentions to influence the area (especially the Panama Canal construction and control) led to the separation of the Department of Panama in 1903 and the establishment of it as a nation. The United States paid Colombia $25,000,000 in 1921, seven years after completion of the canal, for redress of President Roosevelt's role in the creation of Panama, and Colombia recognized Panama under the terms of the Thomson–Urrutia Treaty. Colombia was engulfed in the Year-Long War with Peru over a territorial dispute involving the Amazonas department and its capital Leticia. During the presidency of Álvaro Uribe, the government applied more military pressure on the FARC and other outlawed groups. After the offensive, many security indicators improved. Since 2002 the violence decreased significantly, with some paramilitary groups demobilizing as part of a controversial peace process and the guerrillas lost control of much of the territory they had once dominated. Colombia achieved a great decrease in cocaine production, leading White House drug czar R. Gil Kerlikowske to announce that Colombia is no longer the world's biggest producer of cocaine. In February 2008, millions of Colombians demonstrated against the FARC. 26,648 FARC and ELN fighters have decided to demobilize since 2002. During these years the military forces of the Republic of Colombia managed to be strengthened. The Peace process in Colombia, 2012 refers to the dialogue between the Colombian government and guerrilla of FARC-EP with the aim to find a political solution to the armed conflict. The Colombian government and rebel groups meet in Cuba. As of May 2014, the talks have represented breakthroughs. The Government also began a process of assistance and reparation for victims of conflict. Colombia shows modest progress in the struggle to defend human rights, as expressed by HRW. In terms of international relations, Colombia has moved from a period of tense animosity with Venezuela, towards a prosperous outlook to further enhance integration. Colombia has also won a seat on the Security Council of the UN. Today Colombia is the third largest oil producer in South America and it is estimated that by 2012, Colombia will be producing a million barrels a day. In 2013, the National Administrative Department of Statistics (DANE) reported that 30.6% of the population were living below the poverty line, of which 9.1% in "extreme poverty". 820,000 people have been lifted out of poverty. The Government has also been developing a process of financial inclusion within the country's most vulnerable population. Colombia is bordered to the northwest by Panama; to the east by Venezuela and Brazil; to the south by Ecuador and Peru; it established its maritime boundaries with neighboring countries through seven agreements on the Caribbean Sea and three on the Pacific Ocean. It lies between latitudes 12°N and 4°S, and longitudes 67° and 79°W. Archipelago of San Andrés, Providencia and Santa Catalina in the Caribbean Sea. Protected areas and the "National Park System" cover an area of about 14,254,144.3 hectares (142,541.443 km2) and account for 11.46% of the Colombian territory. Compared to neighboring countries, rates of deforestation in Colombia are still relatively low. Colombia is the sixth country in the world by magnitude of total renewable freshwater supply, and still has large reserves of freshwater. The Amazon is the richest rainforest and biodiverse on the planet. Part of the Amazon River is in Colombia. The government of Colombia takes place within the framework of a presidential representative democratic republic as established in the Constitution of 1991. In accordance with the principle of separation of powers, government is divided into three branches: the executive branch, the legislative branch and the judicial branch. As the head of the executive branch, the President of Colombia serves as both head of state and head of government, followed by the Vice President and the Council of Ministers. The president is elected by popular vote to serve four-year terms and is limited to a maximum of two such terms (increased from one in 2005). At the provincial level executive power is vested in department governors, municipal mayors and local administrators for smaller administrative subdivisions, such as corregimientos or comunas. All regional elections are held one year and five months after the presidential election. The judicial branch is headed by the Supreme Court, consisting of 23 judges divided into three chambers (Penal, Civil and Agrarian, and Labour). The judicial branch also includes the Council of State, which has special responsibility for administrative law and also provides legal advice to the executive, the Constitutional Court, responsible for assuring the integrity of the Colombian constitution, and the Superior Council of Judicature, responsible for auditing the judicial branch. Colombia operates a system of civil law, which since 2005 has been applied through an adversarial system. President of Colombia, Juan Manuel Santos and President of Brazil, Dilma Rousseff. Colombia was one of the 4 founding members of the Pacific Alliance, which is a political, economic and co-operative integration mechanism that promotes the free circulation of goods, services, capital and persons between the members, as well as a common stock exchange and joint embassies in several countries. Colombia is also a member of the United Nations, the Organization of American States, the Organization of Ibero-American States, the Union of South American Nations and the Andean Community of Nations. The executive branch of government is responsible for managing the defense of Colombia, with the President commander-in-chief of the armed forces. The Ministry of Defence exercises day-to-day control of the military and the Colombian National Police. Colombia has 449,415 active military personnel. And in 2012 3.3% of the country's GDP went towards military expenditure, placing it 18th in the world. Colombia's armed forces are the largest in Latin America, and it is the second largest spender on its military after Brazil. Graphical depiction of Colombia's product exports in 28 color-coded categories. Historically an agrarian economy, Colombia urbanised rapidly in the 20th century, by the end of which just 22.7% of the workforce were employed in agriculture, generating just 11.5% of GDP; 18.7% of the workforce were employed in industry and 58.5% in services, responsible for 36% and 52.5% of GDP respectively. Government spending has stabilized at about 29 percent of total domestic output. Public debt remains at around 33 percent of GDP. A strong fiscal climate was reaffirmed by a boost in bond ratings. Inflation has remained relatively low in recent years, standing at 1.94% in December 2013. The national unemployment rate fell to 8.4 percent in December 2013, although the informality is the biggest problem facing the labour market (the income of formal workers climbed 24.8% in 5 years while labor incomes of informal workers rose only 9%). Colombia has Free trade Zone (FTZ), such as Zona Franca del Pacifico, located in the Valle del Cauca, one of the most striking areas for foreign investment. Colombia is rich in natural resources, and its main exports include mineral fuels, oils, distillation products, precious stones, forest products, pulp and paper, coffee, meat, cereals and vegetable oils, cotton, oilseed, sugars and sugar confectionery, fruit and other agricultural products, food processing, processed fish products, beverages, machinery, electronics, military products, aircraft, ships, motor vehicles, metal products, ferro-alloys, home and office material, chemicals and health related products, petrochemicals, agrochemicals, inorganic salts and acids, perfumery and cosmetics, medicaments, plastics, animal fibers, textile and fabrics, clothing and footwear, leather, construction equipment and materials, cement, software, among others. Colombia is also known as an important global source of emeralds, while over 70% of cut flowers imported by the United States are Colombian. Non-traditional exports have boosted the growth of Colombian foreign sales as well as the diversification of destinations of export thanks to new free trade agreements. Principal trading partners are the United States, India, China, the European Union and some Latin American countries. The electricity production in Colombia comes mainly from renewable energy sources. 67.7% is obtained from the hydroelectric generation. The financial sector has grown favorably due to good liquidity in the economy, the growth of credit and in general to the positive performance of the Colombian economy. The Colombian Stock Exchange through the Latin American Integrated Market (MILA) offers a regional market to trade equities. Important inventions related to the medicine have been made in Colombia, such as the first external artificial pacemaker with internal electrodes, invented by the electronics engineer Jorge Reynolds Pombo, invention of great importance for those who suffer from heart failure. Also were invented in Colombia one of the most important techniques for the correction of refractive errors of vision known as LASIK and the Hakim valve for the treatment of Hydrocephalus, among others. Colombia has begun to innovate in military technology for its army and other armies of the world; especially in the design and creation of personal ballistic protection products, military robots, simulators and radar. Transportation in Colombia is regulated within the functions of the Ministry of Transport and entities such as the National Roads Institute (INVÍAS) responsible for the Highways in Colombia (13 000 km), the Aerocivil, responsible for civil aviation and airports, the General Maritime Directorate (Dimar) has the responsibility of coordinating maritime traffic control along with the Colombian Navy, among others and under the supervision of the Superintendency of Ports and Transport. There will be 2,279 kilometres (1,416 miles) of divided expressways in Colombia by 2014. It is expected that the Antonio Nariño Airport of the Pasto and the El Caraño Airport of Quibdó in Chocó become international aerodrome. China and Colombia have discussed a Panama Canal rival, a 'Dry Canal' 220 kilometres (137 miles) rail link between the Pacific and a new city near Cartagena. With an estimated 46 million people in 2008, Colombia is the third-most populous country in Latin America, after Brazil and Mexico. It is also home to the third-largest number of Spanish speakers in the world after Mexico and the United States. At the beginning of the 20th century, Colombia's population was approximately 4 million. The population increased at a rate of 1.9% between 1975 and 2005, predicted to drop to 1.2% over the next decade. Colombia is projected to have a population of 50.7 million by 2015. These trends are reflected in the country's age profile. In 2005 over 30% of the population was under 15 years old, compared to just 5.1% aged 65 and over. The population is concentrated in the Andean highlands and along the Caribbean coast. The nine eastern lowland departments, comprising about 54% of Colombia's area, have less than 3% of the population and a density of less than one person per square kilometer (two persons per square mile). Traditionally a rural society, movement to urban areas was very heavy in the mid-20th century, and Colombia is now one of the most urbanized countries in Latin America. The urban population increased from 31% of the total in 1938 to 60% in 1975, and by 2005 the figure stood at 72.7%. The population of Bogotá alone has increased from just over 300,000 in 1938 to approximately 8 million today. In total seventy one cities now have populations of 100,000 or more (2013). As of 2012 Colombia has the world's largest populations of internally displaced persons (IDPs), estimated to be up to 4.9 million people. The life expectancy is 79 years in 2012 and infant mortality is 15 per thousand in 2012. In 2011, 93.2% of adults and 97.9% of youth are literate and the government spends about 4.4% of its GDP in education. More than 99.2% of Colombians speak the Spanish language, also called Castilian; 65 Amerindian languages, 2 Creole languages and the Romani language are also spoken in the country. English has official status in the San Andrés, Providencia and Santa Catalina Islands. The overwhelming majority of Colombians speak Spanish (see also Colombian Spanish), but in total 101 languages are listed for Colombia in the Ethnologue database. The specific number of spoken languages varies slightly since some authors consider as different languages what others consider are varieties or dialects of the same language, the best estimates recorded that 70 languages are spoken in the country today. Most of these belong to the Chibchan, Arawak, Cariban, language families. There are currently about 850,000 speakers of native languages. The descendants of the original native inhabitants, Spanish colonists, African people originally brought to the country as slaves and 20th-century immigrants from Europe and the Middle East have produced a diverse cultural heritage in Colombia. The demographic distribution reflects a pattern is influenced by colonial history. Whites tend to live mainly in urban centers, like Bogotá or Medellín, and the burgeoning highland cities. The populations of the major cities also include mestizos. Mestizo campesinos (people living in rural areas) also live in the Andean highlands where some Spanish conquerors mixed with the women of Amerindian chiefdoms. Mestizos include artisans and small tradesmen that have played a major part in the urban expansion of recent decades. According to the 2005 census, 49% of Colombia's population is Mestizo or of mixed European and Amerindian ancestry. Approximately 37% is of European ancestry (predominantly Spanish, and a part of Italian, French, and German). About 10.6% is of African ancestry. Indigenous Amerindians comprise 3.4% of the population. The 2005 census reported that the "non-ethnic population", consisting of whites and mestizos (those of mixed white European and Amerindian ancestry), constituted 86% of the national population. The National Administrative Department of Statistics (DANE) does not collect religious statistics, and accurate reports are difficult to obtain. However, based on various studies and a survey, about 90% of the population adheres to Christianity, the majority of which (70.9%) are Roman Catholic. 16.7% of Colombians adhere to Protestantism or Evangelicalism, 4.7% are Atheists and Agnostics, 3.5% claim to believe in God, but they don't believe in religion. 1.8% of Colombians adhere to Jehovah's Witnesses and Adventism and under 1% to Islam, Judaism, Buddhism, Mormonism, Hinduism, Indigenous religions, Hare Krishna movement, Rastafari movement, Orthodox Catholic Church, and spiritual studies. The remaining persons responded they did not know or did not respond to the survey. However, 35.9% of Colombians reported that they did not practice their faith actively. While Colombia remains a mostly Roman Catholic country by baptism numbers, the 1991 Colombian constitution guarantees freedom and equality of religion. Today there is more openness to a great diversity of beliefs. The Nobel literature, Gabriel García Márquez. Colombian architecture is mainly derived of adapting European styles to local conditions, and Spanish influence, especially Andalusian, can be easily seen. The Teatro Colón in Bogotá is a lavish example of Colombian architecture from the Republican period, and the Archbishopric Cathedral also in the capital, was made in the neoclassic style in 1792, by Colombian architect Domingo de Petrés. Rogelio Salmona, whose works are noted for their use of red brick and natural shapes, is a widely renowned Colombian architect. Mariana Pajón, Olympic champion in Cycling at the 2012 Summer Olympics. Radamel Falcao, Colombian football player. Tejo is Colombia’s national sport and is a team sport that involves launching projectiles to hit a target. But of all sports in Colombia, football is the most popular. Colombia was the champion of the 2001 Copa América, in which they set a new record of being undefeated, conceding no goals and winning each match. Interestingly, Colombia was the first team to win FIFA best mover in 1993 where the achievement was first introduced and the second team to win it twice with the second being in 2013. Baseball, another sport rooted in the Caribbean Coast, Colombia was world amateur champion in 1947 and 1965. Baseball is popular in the Caribbean. Mainly in the cities, Cartagena, Barranquilla and Santa Marta. Of those cities have come good players like: Orlando Cabrera, Edgar Rentería who was champion of the World Series in 1997 and 2010, and others who have played in Major League Baseball. Life expectancy at birth in 2000 was 74 years; the life expectancy increased to 79 years by 2012. Health standards in Colombia have improved very much since the 1980s, healthcare reforms have led to the massive improvements in the healthcare systems of the country. Although this new system has widened population coverage by the social and health security system from 21% (pre-1993) to 96% in 2012, health disparities persist, with the poor continuing to suffer less attention in their medical procedures. According to América Economía 16 of the best 40 hospitals in Latin America are located in Colombia. The level and quantity of specialized and sub-specialized physicians is also noticeable. "In average, 85.4% of the physicians in ranked Colombian hospitals are specialized, and 27.7% sub-specialized; whereas the general average for the top 40 was of 82.2% and 22.8%. Public spending on education as a proportion of gross domestic product in 2011 was 4.4%. This represented 15.5% of total government expenditure. In 2011, the primary and secondary net enrollment rates stood at 111% and 97% respectively. School-life expectancy was 13.6 years. A total of 93.2% of the population aged 15 and older were recorded as literate, including 97.9% of those aged 15–24. ^ a b "visibilización estadística de los grupos étnicos". Censo General 2005. Departamento Administrativo Nacional de Estadistica (DANE). http://www.dane.gov.co/files/censo2005/etnia/sys/visibilidad_estadistica_etnicos.pdf. Retrieved 15 June 2013. ^ a b Bushnell, David & Rex A. Hudson (2010) "The Society and Its Environment"; Colombia: a country study: 87. Washingtion D.C.: Federal Research Division, Library of Congress. ^ a b "Animated clock". Colombian State Department. http://www.dane.gov.co/reloj/reloj_animado.php. Retrieved 4 February 2012. ^ a b c d e "World Economic Outlook Database". International Monetary Fund. April 2014. http://www.imf.org/external/pubs/ft/weo/2014/01/weodata/weorept.aspx?pr.x=54&pr.y=10&sy=2014&ey=2014&scsm=1&ssd=1&sort=country&ds=.&br=1&c=233&s=NGDPD%2CNGDPDPC%2CPPPGDP%2CPPPPC&grp=0&a=. Retrieved 19 June 2014. ^ a b "socio-economic policies". dane.gov.co. http://www.dane.gov.co/files/investigaciones/condiciones_vida/pobreza/bol_pobreza_13.pdf. Retrieved 22 March 2014. ^ "Human Development Index (HDI) value". data.undp.org. https://data.undp.org/dataset/Human-Development-Index-HDI-value/8ruz-shxu. Retrieved 2 April 2014. ^ "LEY 47 DE 1993" (in Spanish). alcaldiabogota.gov.co. http://www.alcaldiabogota.gov.co/sisjur/normas/Norma1.jsp?i=2780. Retrieved 23 February 2014. ^ "The official Colombian time" (in Spanish). horalegal.sic.gov.co. http://horalegal.sic.gov.co/. Retrieved 23 February 2014. ^ "Decreto 2153 de 1992, articulo 20" (in Spanish). Presidencia de la República de Colombia. http://www.alcaldiabogota.gov.co/sisjur/normas/Norma1.jsp?i=38168. Retrieved 9 October 2013. ^ a b "The Republic of Colombia shares land borders with five (5) countries". cancilleria.gov.co. http://www.cancilleria.gov.co/en/colombia/sovereignty/land. ^ a b "Maritime borders". cancilleria.gov.co. http://www.cancilleria.gov.co/en/colombia/sovereignty/maritime. ^ Nicolás del Castillo Mathieu (March 1992). "La primera vision de las costas Colombianas, Repaso de Historia" (in Spanish). Revista Credencial. http://www.lablaa.org/blaavirtual/revistas/credencial/marzo1992/marzo3.htm. Retrieved 29 February 2008. ^ a b c d CIA world fact book. "Colombia". CIA. https://www.cia.gov/library/publications/the-world-factbook/geos/co.html. Retrieved 24 May 2009. ^ a b c "The ethnic and cultural diversity of Colombia" (in Spanish). pedagogica.edu.co. http://www.pedagogica.edu.co/storage/ps/articulos/pedysab15_09arti.pdf. Retrieved 26 March 2014. 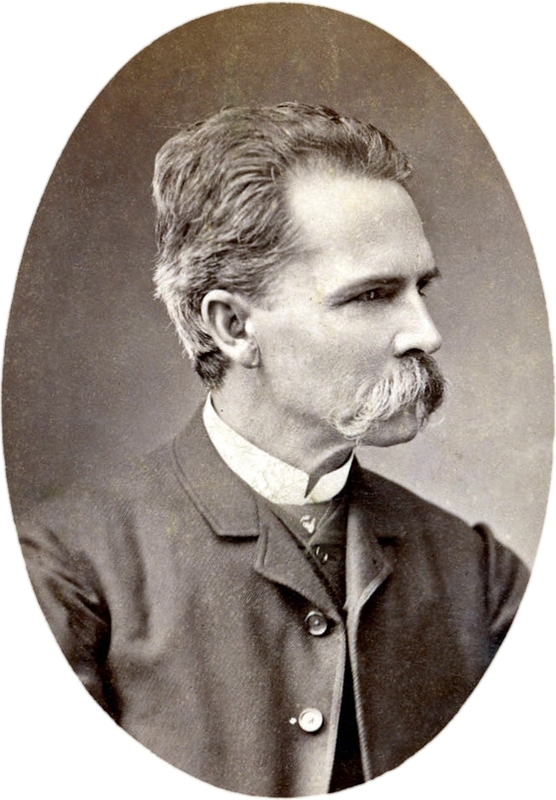 ^ Luis Fernando Potes. "Colombia is the second most biodiverse country in the world" (in Spanish). prodiversitas.bioetica.org. http://www.prodiversitas.bioetica.org/nota63.htm. Retrieved 9 March 2014. ^ "Paisajes naturales de Colombia" (in Spanish). telepolis.com. Archived from the original on 2009-03-20. http://web.archive.org/web/20090320222757/http://www.telepolis.com/cgi-bin/web/DISTRITODOCVIEW?url=/1604/doc/Parquesnaturales/paisajes.htm. Retrieved 16 May 2010. ^ Steve Slater (27 April 2010). "After BRICs, look to CIVETS for growth – HSBC CEO". Reuters. http://www.reuters.com/article/2010/04/27/hsbc-emergingmarkets-idUSLDE63Q26Q20100427. ^ a b "International Trade Centre: Colombia Exports". intracen.org. http://legacy.intracen.org/appli1/TradeCom/TP_EP_CI.aspx?RP=170&YR=2012. Retrieved 24 February 2014. ^ "Colombian economy" (in spanish). banrepcultural.org. http://www.banrepcultural.org/blaavirtual/ayudadetareas/economia/econo106.htm. Retrieved 16 April 2013. ^ a b Carlos Restrepo Piedrahita (February 1992). "El nombre "Colombia", El único país que lleva el nombre del Descubrimiento" (in Spanish). Revista Credencial. http://www.lablaa.org/blaavirtual/revistas/credencial/febrero1992/febrero2.htm. Retrieved 29 February 2008. ^ Hoopes, John (1994). "Ford Revisited: A Critical Review of the Chronology and Relationships of the Earliest Ceramic Complexes in the New World, 6000-1500 B.C. (1994)". Journal of World Prehistory 8 (1): 1–50. ^ Jorge Cerdá Crespo (2010) (in Spanish). Conflictos coloniales: la guerra de los nueve años 1739-1748. Universidad de Alicante. ISBN 9788497171274. http://books.google.com.co/books?id=iHc5HlQpmmUC&lpg=PA3&hl=es&pg=PA3#v=onepage&q&f=false. ^ "Alonso de Ojeda" (in Spanish). biografiasyvidas.com. http://www.biografiasyvidas.com/biografia/o/ojeda.htm. Retrieved 2 April 2014. ^ "Rodrigo de Bastidas" (in Spanish). biografiasyvidas.com. http://www.biografiasyvidas.com/biografia/b/bastidas.htm. Retrieved 2 April 2014. ^ "Cristóbal Colón" (in Spanish). biografiasyvidas.com. http://www.biografiasyvidas.com/biografia/c/colon_cristobal.htm. Retrieved 2 April 2014. ^ "Vasco Núñez de Balboa" (in Spanish). biografiasyvidas.com. http://www.biografiasyvidas.com/biografia/b/balboa.htm. Retrieved 2 April 2014. ^ Vázquez, Trinidad Miranda (1976) (in Spanish). La gobernación de Santa Marta (1570-1670) Vol. 232. Editorial CSIC-CSIC Press. p. 3. ISBN 9788400042769. http://books.google.com.co/books?id=m5zI94b6u_4C&lpg=PP1&hl=es&pg=PP1#v=onepage&q&f=false. ^ Plá, María del Carmen Borrego (1983) (in Spanish). Cartagena de Indias en el siglo XVI. Vol. 288. Editorial CSIC-CSIC Press. pp. 3–5. ISBN 9788400054403. http://books.google.com.co/books?id=hV-bQJo8wOIC&lpg=PP1&hl=es&pg=PP1#v=onepage&q&f=false. ^ Francis, John Michael, ed (2007). Invading Colombia: Spanish accounts of the Gonzalo Jiménez de Quesada expedition of conquest Vol. 1. Penn State Press. ISBN 9780271029368. http://books.google.com.co/books?id=P1DEFqZ6c5QC&lpg=PP1&hl=es&pg=PP1#v=onepage&q&f=false. ^ Silvia Padilla Altamirano (1977) (in Spanish). La encomienda en Popayán: tres estudios. Editorial CSIC - CSIC Press. pp. 4–5. ISBN 9788400036126. http://books.google.com.co/books?id=785fTqvsPSEC&lpg=PP1&hl=es&pg=PP1#v=onepage&q&f=false. ^ Massimo Livi Bacci (2012) (in Spanish). El dorado en el pantano. Marcial Pons Historia. ISBN 9788492820658. http://books.google.com.co/books?id=tMEp1OPtF7QC&lpg=PP1&hl=es&pg=PP1#v=onepage&q&f=false. ^ Ramírez, Natalia, and Germán Gutiérrez. "Félix de Azara: Observaciones conductuales en su viaje por el Virreinato del Río de la Plata." Revista de historia de la psicología 31.4 (2010): 52-53. ^ "El Dorado Legend Snared Sir Walter Raleigh". science.nationalgeographic.com. http://science.nationalgeographic.com/science/archaeology/el-dorado/. ^ John Huxtable Elliott (2007). Empires of the Atlantic World: Britain and Spain in America, 1492-1830. Yale University Press. pp. 124–125. ISBN 9780300123999. http://books.google.com.co/books?id=Q6ucuphGA3YC&lpg=PP1&hl=es&pg=PA124#v=onepage&q&f=false. ^ "Law VIII ("Royal Audiencia and Chancery of Santa Fe in the New Kingdom of Granada") of Title XV ("Of the Royal Audiencias and Chanceries of the Indies") of Book II". congreso.gob.pe. http://www.congreso.gob.pe/ntley/Imagenes/LeyIndia/0102015.pdf. Retrieved 4 April 2014. ^ Fernando Mayorga García; Juana M. Marín Leoz; Adelaida Sourdis Nájera. "El patrimonio documental de Bogotá, Siglos XVI - XIX: Instituciones y Archivos". Subdirección Imprenta Distrital - D.D.D.I. ISBN 978-958-717-064-1. http://www.archivobogota.gov.co/libreria/pdf/LIBRO_PATRIMONIO_DOCUMENTAL.pdf. ^ Julián Bautista Ruiz Rivera (1975). Encomienda y mita en Nueva Granada en el siglo XVII. Editorial CSIC - CSIC Press. p. XXI - XXII. ISBN 9788400041762. http://books.google.com.co/books?id=5R0dPbOImsUC&lpg=PP1&hl=es&pg=PP1#v=onepage&q&f=false. ^ Jorge Augusto Gamboa M.. "Las sociedades indígenas del Nuevo Reino de Granada bajo el dominio español" (in Spanish). Instituto Colombiano de Antropología e Historia. http://www.icanh.gov.co/recursos_user/documentos/editores/201/Articulos/SociedadesIndigenas-Reyes2009.pdf. ^ "Las plantas medicinales en la época de la colonia y de la independencia" (in Spanish). colombiaaprende.edu.co. http://www.colombiaaprende.edu.co/html/productos/1685/articles-242836_proyecto_documento.pdf. ^ Mayorga, Fernando (2002). "La propiedad de tierras en la Colonia: Mercedes, composición de títulos y resguardos indígenas" (in Spanish). Revista Credencial Historia - banrepcultural.org. http://www.banrepcultural.org/blaavirtual/revistas/credencial/mayo2002/propdetierras.htm. ^ Yves Moñino; Armin Schwegler (2002). Palenque, Cartagena y Afro-Caribe: historia y lengua. Walter de Gruyter. p. VII - IX, 21–35. ISBN 9783110960228. http://books.google.com.co/books?id=mv4iAAAAQBAJ&lpg=PR1&hl=es&pg=PR1#v=onepage&q&f=false. ^ "Domingo Bioho: Su trayecto entre hombre y héroe" (in Spanish). banrepcultural.org. http://www.banrepcultural.org/blaavirtual/antropologia/magnom/nina6.htm. ^ Alvaro Gärtner (2005). Los místeres de las minas: crónica de la colonia europea más grande de Colombia en el siglo XIX, surgida alrededor de las minas de Marmato, Supía y Riosucio. Universidad de Caldas. ISBN 9789588231426. http://books.google.com.co/books?id=5cUdM30KwxkC&lpg=PP1&hl=es&pg=PP1#v=onepage&q&f=false. ^ Germán Colmenares. "Historia económica y órdenes de magnitud, Capítulo 1: La Formación de la Economía Colonial (1500-1740)." (in Spanish). banrepcultural.org. http://www.banrepcultural.org/blaavirtual/economia/histecon/histecon2a.htm. ^ Margarita González. "La política económica virreinal en el Nuevo Reino de Granada: 1750-1810" (in Spanish). banrepcultural.org. http://admin.banrepcultural.org/sites/default/files/lablaa/revistas/revanuario/ancolh11/articul/art5/art5a.pdf. ^ Rivera, Julián Bautista Ruiz (1997). "Reformismo local en el nuevo Reino de Granada. Temas americanistas N° 13" (in Spanish). pp. 80–98. http://institucional.us.es/tamericanistas/uploads/revista/13/RUIZ-RIVERA..pdf. ^ Jaime U. Jaramillo; Adolfo R. Maisel; Miguel M. Urrutia (1997). Transferring Wealth and Power from the Old to the New World: Monetary and Fiscal Institutions in the 17th Through the 19th Centuries - Chapter 12. Cambridge University Press. ISBN 9780521027274. http://www.banrep.gov.co/sites/default/files/publicaciones/archivos/borra074.pdf. ^ "José Celestino Mutis in New Granada: A life at the service of an Expedition (1760-1808)". Real Jardín Botánico. http://www.rjb.csic.es/jardinbotanico/jardin/index.php?len=en&Pag=89. ^ Angela Perez-Mejia (2004). A Geography of Hard Times: Narratives about Travel to South America, 1780-1849 - Part I: The scholar and the baron: Voyage of the exact sciences. SUNY Press. ISBN 9780791460139. http://books.google.com.co/books?id=1AcBiP9mOmoC&lpg=PP1&hl=es&pg=PP1#v=onepage&q&f=false. ^ John Wilton Appel (1994). Francisco José de Caldas: A Scientist at Work in Nueva Granada. American Philosophical Society. ISBN 9780871698452. http://books.google.com.co/books?id=5x4LAAAAIAAJ&lpg=PP1&hl=es&pg=PA3#v=onepage&q&f=false. ^ Aguilera, Miguel (1965). La Legislacion y el derecho en Colombia. Historia extensa de Colombia. 14. Bogota: Lemer. pp. 428–442. ^ Charles Bergquist and David J. Robinson (1997–2005). "Colombia". Microsoft Encarta Online Encyclopedia 2005. Microsoft Corporation. Archived from the original on 31 October 2009. http://www.webcitation.org/5kwsWoGia. Retrieved 16 April 2006. 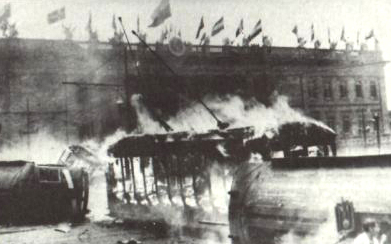 On 9 April 1948, Gaitán was assassinated outside his law offices in downtown Bogotá. The assassination marked the start of a decade of bloodshed, called La Violencia (the violence), which took the lives of an estimated 180,000 Colombians before it subsided in 1958. ^ Carlos Horacio Urán (1986). "Colombia y los Estados Unidos en la Guerra de Corea" (in Spanish). The Kellogg Institute for International Studies. http://kellogg.nd.edu/publications/workingpapers/WPS/069.pdf. ^ Lilian Yaffe (3 October 2011). "Armed conflict in Colombia: analysis of the economic, social and institutional causes of violent opposition" (in Spanish). icesi.edu.co. http://www.icesi.edu.co/revistas/index.php/revista_cs/article/view/1133/1509. Retrieved 24 April 2013. ^ "Guerrillas" (in Spanish). elnuevosiglo.com.co. 24 January 2013. http://www.elnuevosiglo.com.co/articulos/1-2013-guerrillas-declaran-guerra-hidrocarburos.html. Retrieved 14 October 2013. ^ Mario A. Murillo; Jesús Rey Avirama (2004). Colombia and the United States: war, unrest, and destabilization. Seven Stories Press. p. 54. ISBN 978-1-58322-606-3. http://books.google.ca/books?id=EdhCanqQN8kC&lpg=PP1&hl=es&pg=PP1#v=onepage&q&f=false. ^ "20 grandes cambios que generó la Constitución de 1991" (in Spanish). elpais.com.co. http://www.elpais.com.co/elpais/colombia/20-grandes-cambios-genero-constitucion-1991. Retrieved 28 March 2013. ^ "Colombian Constitution of 1991" (in Spanish). secretariasenado.gov.co. http://www.secretariasenado.gov.co/index.php/leyes-y-antecedentes/constitucion-y-sus-reformas. Retrieved 10 March 2014. ^ a b "Military Personnel - Logros de la Política Integral de Seguridad y Defensa para la Prosperidad" (in Spanish). mindefensa.gov.co. http://www.mindefensa.gov.co/irj/go/km/docs/Mindefensa/Documentos/descargas/estudios%20sectoriales/info_estadistica/Logros_Sector_Defensa.pdf. ^ "Colombia grew less coca in 2012, UN survey reports". un.org. http://www.un.org/apps/news/story.asp?NewsID=45589&Cr=drugs&Cr1=#.UgRVaOEu3zo. Retrieved 8 August 2013. ^ "Colombia no longer top cocaine producer". usatoday.com. 30 July 2012. http://content.usatoday.com/communities/theoval/post/2012/07/white-house-colombia-is-no-longer-top-cocaine-producer/1. Retrieved 24 April 2013. ^ "Oscar Morales and One Million Voices Against FARC". movements.org. 23 July 2010. http://www.movements.org/case-study/entry/oscar-morales-and-one-million-voices-against-farc/. Retrieved 1 April 2013. ^ "One Million Voices Against the FARC: A Milestone for Freedom". bushcenter.org. 4 February 2011. http://www.bushcenter.org/blog/2012/09/13/one-million-voices-against-farc-milestone-freedom. Retrieved 1 April 2013. ^ "One Million Voices Against FARC" (in Spanish). millondevoces.org. http://www.millondevoces.org/contenido/. Retrieved 1 April 2013. ^ "Desmovilización, principal arma contra las guerrillas" (in Spanish). eltiempo.com. http://www.eltiempo.com/justicia/desmovilizacion-principal-arma-contra-las-guerrillas_13077339-4. Retrieved 26 September 2013. ^ "Presidente Santos reitera que seguirá fortaleciendo las Fuerzas Armadas inclusive en el posconflicto" (in Spanish). rcnradio.com. http://www.rcnradio.com/noticias/presidente-santos-reitera-que-seguira-fortaleciendo-las-fuerzas-armadas-inclusive-en-el. Retrieved 20 December 2013. ^ "Colombia and Farc rebels agree on drug trade plan". bbc.com. http://www.bbc.com/news/world-latin-america-27451784. Retrieved 17 May 2014. ^ "Ley de víctimas y restitución de tierras" (in Spanish). derechoshumanos.gov.co. http://www.derechoshumanos.gov.co/Documents/130220-1-cartilla-ley-victimas-restitucion-tierras.pdf. Retrieved 23 October 2013. ^ "Unidad de restitución de tierras". restituciondetierras.gov.co. http://restituciondetierras.gov.co/. Retrieved 23 March 2013. ^ Colombia 'ha mejorado en el clima político': Human Rights Watch. Caracol.com.co (11 October 2011). Retrieved on 14 May 2012. ^ Colombia lidera Consejo de Seguridad de ONU en medio de crisis árabe – Política en Colombia y el Mundo. Eltiempo.Com (2 April 2011). Retrieved on 14 May 2012. ^ efe / bogotá (2012-12-31). "Colombia supera el millón de barriles de petróleo diarios". ABC.es. http://www.abc.es/internacional/20121231/abci-colombia-petroleo-201212302111.html. Retrieved 2013-02-18. ^ "La inclusión financiera". larepublica.co. http://www.larepublica.co/finanzas/la-inclusi%C3%B3n-financiera-ser%C3%A1-tema-fuerte-en-el-congreso-de-asobancaria_125936. Retrieved 23 March 2013. ^ "Colombia: making many millionaires". Financial Times. http://blogs.ft.com/beyond-brics/2013/10/21/colombia-making-many-millionaires/. Retrieved 29 March 2014. ^ "País de ricos" (in Spanish). dinero.com. http://www.dinero.com/edicion-impresa/negocios/articulo/pais-ricos/163667. Retrieved 8 April 2013. ^ a b c d "Natural regions of Colombia and description of the three branches of the andes cordillera". colombia-sa.com. http://www.colombia-sa.com/geografia/geografia-in.html. Retrieved 7 March 2014. ^ "Colombia is part of the Ring of Fire" (in Spanish). seisan.ingeominas.gov.co. http://seisan.ingeominas.gov.co/RSNC/index.php/material-educativo. Retrieved 7 March 2014. ^ "Hydrography of Colombia". colombia-sa.com. http://www.colombia-sa.com/geografia/geografia-in-2.html. Retrieved 7 March 2014. ^ "Dirección de Parques Nacionales Naturales de Colombia" (in Spanish). http://www.parquesnacionales.gov.co/portal/sistema-de-parques-nacionales-naturales/. Retrieved 4 December 2013. ^ "Change in forest area, 1990/2010 (%)". data.undp.org. https://data.undp.org/dataset/Change-in-forest-area-1990-2010-/77qj-63mn#column-menu. Retrieved 2 April 2014. ^ "Table 1: Total Renewable Freshwater Supply, by Country". worldwater.org. http://worldwater.org/water-data/. ^ a b c "Thermal floors" (in Spanish). banrepcultural.org. http://www.banrepcultural.org/blaavirtual/economia/colombia/eco1.htm. Retrieved 25 February 2014. 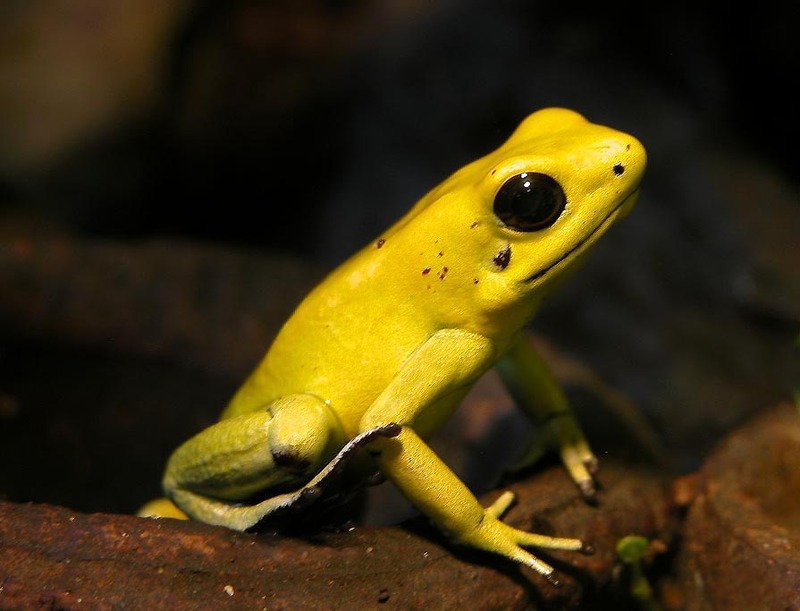 ^ "Phyllobates terribilis". amphibiaweb.org. http://amphibiaweb.org/cgi/amphib_query?where-genus=phyllobates&where-species=terribilis. Retrieved 9 October 2013. ^ Delegatarios de países megadiversos. "Declaración de Cancún de países megadiversos afínes" (in Spanish). inecc.gob.mx. http://www.inecc.gob.mx/descargas/ai/con199328.pdf. Retrieved 9 March 2014. ^ "Colombia Celebrates over 1,900 Bird Species". proaves.org. http://www.proaves.org/colombia-officially-the-nation-with-the-greatest-diversity-of-birds-and-a-new-world-record/?lang=en. Retrieved 18 December 2013. ^ "Flora of Colombia" (in Spanish). parquesnacionales.gov.co. http://www.parquesnacionales.gov.co/PNN/portel/libreria/php/frame_detalle.php?h_id=5274. Retrieved 18 December 2013. ^ "Colombia accounts for around 10% of the flora and fauna of the world.". humboldt.org.co. 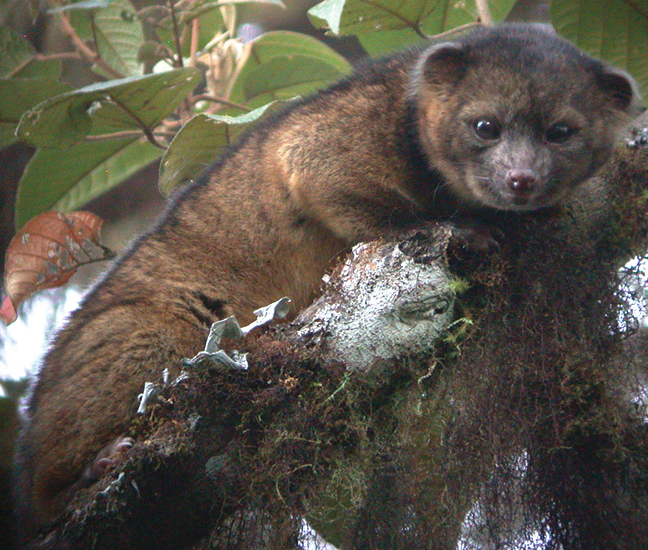 http://www.humboldt.org.co/component/k2/item/62-cifras?Itemid=271&highlight=YToxOntpOjA7czo4OiJjb2xvbWJpYSI7fQ==. Retrieved 21 July 2013. ^ "System of information about biodiversity of Colombia" (in spanish). Sistema de Información sobre Biodiversidad de Colombia. http://www.sibcolombia.net/web/sib/cifras. Retrieved 5 April 2013. ^ "The Government of Colombia" (in Spanish). banrepcultural.org. http://www.banrepcultural.org/blaavirtual/ayudadetareas/gobierno/gob3a.htm. Retrieved 14 March 2014. ^ "Supreme Court of Colombia" (in Spanish). cortesuprema.gov.co. http://www.cortesuprema.gov.co/. Retrieved 15 March 2014. ^ Ipsos-Napoleon Franco poll (1 June 2009). "Si no es Uribe, es Santos" (in Spanish). semana.com. http://www.semana.com/politica/articulo/si-no-uribe-santos/103711-3. Retrieved 15 March 2014. ^ "escrutinio 2ª Vuelta 2010" (in Spanish). registraduria.gov.co. http://www.registraduria.gov.co/imagenes/escrutinio_seg_vuelta.pdf. ^ "escrutinio 2ª Vuelta 2014" (in Spanish). registraduria.gov.co. http://www3.registraduria.gov.co/presidente2014/preconteo/2v/99PR2/DPR9999999_L1.htm. ^ "The Ministry of Foreign Affairs". cancilleria.gov.co. http://www.cancilleria.gov.co/en/ministry/the_ministry. Retrieved 15 March 2014. ^ "The Pacific Alliance and its Objectives". alianzapacifico.net. http://alianzapacifico.net/en/home-eng/the-pacific-alliance-and-its-objectives/. Retrieved 10 February 2014. ^ "Military expenditure (% of GDP)". data.worldbank.org. http://data.worldbank.org/indicator/MS.MIL.XPND.GD.ZS. Retrieved 15 December 2013. ^ "The Colombian military" (in Spanish). mindefensa.gov.co. http://www.mindefensa.gov.co/irj/portal/Mindefensa?NavigationTarget=navurl://fafe281c487d72799bedcc0ac7b7dcc6. Retrieved 10 March 2014. ^ "Military units" (in Spanish). ejercito.mil.co. http://www.ejercito.mil.co/?idcategoria=253869. Retrieved 10 March 2014. ^ "Forces and commands" (in Spanish). armada.mil.co. http://www.armada.mil.co/es/content/fuerzas-y-comandos. Retrieved 10 March 2014. ^ "Air units" (in Spanish). ejercito.mil.co. https://www.fac.mil.co/?idcategoria=45055. Retrieved 10 March 2014. ^ a b "Codificación de la División Político-Administrativa de Colombia (Divipola)" (in Spanish). dane.gov.co. http://www.dane.gov.co/Divipola/. Retrieved 15 March 2014. ^ Herrera Llanos, W (2011). "Régimen municipal en Colombia (Continuación del tema sobre Organización Territorial)". Retrieved on 9 March 2014. ^ "Colombia’s GDP growth". data.worldbank.org. http://data.worldbank.org/indicator/NY.GDP.MKTP.KD.ZG/countries/CO?display=graph. Retrieved 9 March 2014. ^ "Colombia - Heritage Foundation, Index of Economic Freedom". heritage.org. http://www.heritage.org/index/country/colombia. Retrieved 29 September 2013. ^ "Colombia Inflation Rate". banrep.gov.co. http://www.banrep.gov.co/es/ipc. Retrieved 19 December 2013. ^ "Colombia Unemployment Rate". dane.gov.co. http://www.dane.gov.co/files/investigaciones/boletines/ech/ech/bol_ech_a%C3%B1o_13.pdf. Retrieved 31 January 2014. ^ "Incomes of informal workers grow less" (in Spanish). portafolio.co. http://www.portafolio.co/economia/ingresos-trabajadores-informales-colombia. Retrieved 19 December 2013. ^ "Colombia´s Permanent Free Trade Zones Directory". investincolombia.com.co. http://www.investincolombia.com.co/investment-incentives/permanent-free-trade-zone.html. Retrieved 19 December 2013. ^ "El Cerrejón" (in Spanish). barrancas-laguajira.gov.co. http://barrancas-laguajira.gov.co/apc-aa-files/32653032376432393366363535323939/MINA.pdf. Retrieved 9 March 2014. ^ Maya, Mario, Joaquín Buenaventura, and Rosalba Salinas (2004). "Estado del conocimiento de la explotación de esmeraldas en Colombia." (in Spanish). ingeominas.gov.co. http://aplicaciones1.ingeominas.gov.co/Bodega/i_vector/220/04/1000/23452/documento/pdf/2105234521101000.pdf. Retrieved 27 March 2014. ^ mincit.gov.co. "Non-traditional exports" (in spanish). http://www.mincit.gov.co/publicaciones.php?id=4930. Retrieved 31 January 2014. ^ "Exports - partners". dane.gov.co. http://www.dane.gov.co/files/investigaciones/boletines/exportaciones/bol_exp_ene14.pdf. Retrieved 3 March 2014. ^ "Imports - partners". dane.gov.co. http://www.dane.gov.co/files/investigaciones/boletines/importaciones/bol_impo_dic13.pdf. Retrieved 3 March 2014. ^ "Colombian Electricty Market - Evolución Variables de Generación Febrero de 2014" (in spanish). Unidad de Planeación Minero Energética de Colombia. http://www.siel.gov.co/Inicio/Generaci%C3%B3n/Estad%C3%ADsticasyvariablesdegeneraci%C3%B3n/tabid/115/Default.aspx. ^ "Informe de operaciones" (in spanish). superfinanciera.gov.co. https://www.superfinanciera.gov.co/jsp/loader.jsf?lServicio=Publicaciones&lTipo=publicaciones&lFuncion=loadContenidoPublicacion&id=61066. Retrieved 9 March 2014. ^ "Reporte de Estabilidad Financiera" (in spanish). banrep.gov.co. http://www.banrep.gov.co/reporte-estabilidad-financiera. Retrieved 9 March 2014. ^ "The Latin American Integrated Market (MILA)". mercadomila.com. http://www.mercadomila.com/QuienesSomos. Retrieved 14 March 2014. ^ "Colombia's Colcap Index" (in spanish). banrep.org. http://www.banrep.org/series-estadisticas/see_m_bursatil.htm. Retrieved 9 March 2014. ^ "UNWTO highlights growth of tourism in Colombia in the last ten years" (in spanish). lainformacion.com. 25 June 2014. http://noticias.lainformacion.com/economia-negocios-y-finanzas/turismo-y-tiempo-libre/la-omt-destaca-crecimiento-del-turismo-en-colombia-en-los-ultimos-diez-anos_Qf0PXwFP6sbVhdnrGcFoe3/. ^ "UNWTO Tourism Highlights, 2014 Edition". unwto.org. http://dtxtq4w60xqpw.cloudfront.net/sites/all/files/pdf/unwto_highlights14_en_hr.pdf. ^ "research groups in science and technology" (in (Spanish)). colciencias.gov.co. http://www.colciencias.gov.co/programa_estrategia/grupos-de-investigaci-n-fortalecimiento-y-consolidaci-n. Retrieved 2013-06-10. ^ "entrepreneurship and innovation in Colombia". venturebeat.com. http://venturebeat.com/2013/09/29/the-silicon-valleys-of-latin-america-a-tale-of-3-nations/. Retrieved 1 October 2013. ^ "Colombia Startups" (in Spanish). apps.co. https://apps.co/. Retrieved 14 February 2014. ^ "Corporation for biological research in Medellín" (in Spanish). cib.org.co. http://www.cib.org.co/web/. Retrieved 28 October 2013. ^ "International Center for Tropical Agriculture". http://ciat.cgiar.org/. Retrieved 1 October 2013. ^ "Inventos colombianos" (in Spanish). 20minutos.es. http://listas.20minutos.es/lista/mejores-inventos-colombianos-320000/. Retrieved 1 October 2013. ^ "highly effective simulators and radar". codaltec.com. http://www.codaltec.com/web/english/home.html. Retrieved 14 February 2014. ^ "bulletproof clothing". miguelcaballero.com. http://miguelcaballero.com/en/. Retrieved 14 January 2014. ^ "Colombian Naval Industry". cotecmar.com. http://www.cotecmar.com. Retrieved 14 February 2014. ^ "Crean en Colombia a ‘Arcadio’, robot contra minas antipersona" (in Spanish). canalrcnmsn.com. http://www.canalrcnmsn.com/content/crean_en_colombia_%E2%80%98arcadio%E2%80%99_robot_contra_minas_antipersona. Retrieved 1 October 2013. ^ "Plantilla detectora de minas antipersona". lemurstudio.com.co. http://www.lemurstudio.com.co/#popup_portfolio-plus-1. Retrieved 14 January 2014. ^ "Beyond Alzheimer’s: the "Paisa Mutation"". udea.edu.co. http://www.udea.edu.co/portal/page/portal/bActualidad/Principal_UdeA/News/Tab/AEF4F8549743CF0AE04018C8341F754F. Retrieved 1 October 2013. ^ "Científicos colombianos" (in Spanish). cienciagora.com.co. http://cienciagora.com.co/galeria_de_cientificos.html. Retrieved 28 October 2013. ^ "científicos del país más consultados" (in Spanish). portal.redcolombiana.com. http://portal.redcolombiana.com/foros/estos-son-los-8-cientificos-del-pais-mas-consultad. Retrieved 28 October 2013. ^ "Estos son los científicos colombianos más destacados en el último lustro" (in Spanish). cambio.com.co. http://www.cambio.com.co/cienciacambio/856/ARTICULO-WEB-NOTA_INTERIOR_CAMBIO-6672909.html. Retrieved 28 October 2013. ^ "Aeronáutica Civil de Colombia – Objetivos Institucionales". Portal.aerocivil.gov.co. http://portal.aerocivil.gov.co/portal/page/portal/Aerocivil_Portal_Internet/aerocivil/institucion/objetivo. Retrieved 2013-03-11. ^ "the General Maritime Directorate (Dimar)" (in Spanish). dimar.mil.co. http://www.dimar.mil.co/en/content/roles-and-responsibilities. Retrieved 9 March 2014. ^ "Superintendencia De Puertos Y Transporte". Supertransporte.gov.co. http://www.supertransporte.gov.co/nueva/nuestra_funciones.php. Retrieved 2013-03-11. ^ García, Alfredo (18 November 2011). "El Gobierno invertirá en la construcción de más dobles calzadas" (in Spanish). El Pais. http://elpais.com.co/elpais/colombia/noticias/gobierno-invertira-en-construccion-dobles-calzadas. ^ "República de Colombia Libertad y Orden". Aerocivil.gov.co. 2011-05-16. http://www.aerocivil.gov.co/AIS/E-AIP/Paginas/Aerodromos.aspx. Retrieved 2013-06-15. ^ Rathbone, Jhn Paul and Mapstone, Naomi (13 February 2011). "China in talks over Panama Canal rival". Financial Times. http://www.ft.com/cms/s/0/7e14756c-37a9-11e0-b91a-00144feabdc0.html?ftcamp=rss#axzz1Dw79Zosw. Retrieved 14 May 2011. ^ "Colombia: A Country Study". Countrystudies.us. http://countrystudies.us/colombia/36.htm. Retrieved 16 May 2010. ^ "Internally Displaced People Figures". The Office of the United Nations High Commissioner for Refugees. http://www.unhcr.org/pages/49c3646c23.html. ^ a b "Life expectancy at birth". who.int. http://gamapserver.who.int/gho/interactive_charts/mbd/life_expectancy/atlas.html. ^ "Mortality rate, infant (per 1,000 live births)". data.worldbank.org. http://data.worldbank.org/indicator/SP.DYN.IMRT.IN. Retrieved 5 March 2014. ^ a b "UNESCO Institute for Statistics Colombia Profile". http://stats.uis.unesco.org/unesco/TableViewer/document.aspx?ReportId=289&IF_Language=eng&BR_Country=1700&BR_Region=40520. Retrieved 8 March 2014. ^ "Languages of Colombia" (in Spanish). banrepcultural.org. http://www.banrepcultural.org/blaavirtual/antropologia/lengua/clas2.htm. Retrieved 9 October 2013. ^ "Jon Landaburu, Especialista de las lenguas de Colombia" (in Spanish). ambafrance-co.org. http://www.ambafrance-co.org/Jon-Landaburu-Especialista-de-las. Retrieved 9 October 2013. ^ "Map of the languages of Colombia" (in Spanish). lenguasdecolombia.gov.co. http://www.lenguasdecolombia.gov.co/mapalenguas/inicio.swf. Retrieved 9 October 2013. ^ "The Languages of Colombia". Ethnologue.com. http://www.ethnologue.com/country/CO. Retrieved 16 May 2010. ^ "Native languages of Colombia" (in Spanish). lenguasdecolombia.gov.co. http://www.lenguasdecolombia.gov.co/content/ley-de-lenguas-nativas. Retrieved 25 March 2014. ^ a b "Hostein, N. (2010). El pueblo wayuu de la Guajira colombo-venezolana: un panorama de su cultura. Cuadernos de Antropología, 20(1).". http://revistas.ucr.ac.cr/index.php/antropologia/article/view/2006/1973. Retrieved 27 March 2014. ^ "Society and slavery" (in Spanish). colombia.com. http://www.colombia.com/colombiainfo/nuestrahistoria/esclavista.asp. Retrieved 9 September 2013. ^ "Resguardos indígenas - Concentra el 43% de los bosques naturales" (in Spanish). siac.gov.co. https://www.siac.gov.co/Estado_Ecosistemas_Bosque/Resguardos_indigenas1.aspx. Retrieved 27 March 2014. ^ "Los pueblos indígenas de Colombia en el umbral del nuevo milenio. Población, cultura y territorio: bases para el fortalecimiento social y económico de los pueblos indígenas". dnp.gov.co. https://www.dnp.gov.co/Programas/DesarrolloTerritorial/OrdenamientoyDesarrolloTerritorial/Grupos%C3%89tnicos.aspx. Retrieved 27 March 2014. ^ "Ratifications for Colombia". ilo.org. http://www.ilo.org/dyn/normlex/en/f?p=1000:11200:0::NO:11200:P11200_COUNTRY_ID:102595. Retrieved 26 March 2014. ^ "Ethnic groups in Colombia" (in Spanish). dane.gov.co. http://www.dane.gov.co/censo/files/presentaciones/grupos_etnicos.pdf. Retrieved 26 March 2014. ^ Luis Álvaro Gallo Martínez (2011). "Inmigrantes a Colombia: Personajes extranjeros llegados a Colombia". rodriguezuribe.co. http://www.rodriguezuribe.co/histories/Inmigrantes%20a%20Colombia%20-%20Luis%20Alvaro%20Gallo.pdf. ^ Wabgou, M., Vargas, D. & Carabalí, J. A. (2012). "Las migraciones internacionales en Colombia. Investigación & Desarrollo, 20(1) 142-167.". redalyc.org. http://www.redalyc.org/articulo.oa?id=26823176007. ^ "The Arab immigration to Colombia" (in Spanish). nodo50.org. http://www.nodo50.org/csca/agenda08/misc/arti48.html. Retrieved 30 January 2014. ^ Echeverry Hernández. "Análisis de la migración venezolana a Colombia durante el gobierno de Hugo Chávez (1999–2011). Identificación de capital social y compensación económica" (in Spanish). Revista Análisis Internacional - Revistas.utadeo.edu.co. http://revistas.utadeo.edu.co/index.php/RAI/article/view/84/88. Retrieved 28 March 2014. ^ Llegaron los venezolanos. Semana.com (11 March 2012). Retrieved on 8 October 2012. ^ Beltrán Cely, William Mauricio. "Descripción cuantitativa de la pluralización religiosa en Colombia". Universitas humanística 73 (2012): 201-238. - bdigital.unal.edu.co. http://www.bdigital.unal.edu.co/8486/1/williammauriciobeltran.2011.pdf. ^ Legend of Yurupary. Cooperativa Editorial Magisterio. 2006. ISBN 9789582008369. http://books.google.com.co/books?id=s_ADFUglHo0C&lpg=PP1&hl=es&pg=PP1#v=onepage&q&f=false. ^ "Cronistas del Nuevo Reino de Granada". ihlc.udea.edu.co. https://sites.google.com/site/cursodeliteraturacolombiana/unidad-2/los-cronistas. Retrieved 31 March 2014. ^ "Vida, pasión y muerte del romanticismo en Colombia". biblioteca-virtual-antioquia.udea.edu.co. http://biblioteca-virtual-antioquia.udea.edu.co/pdf/8/8_2024432110.pdf. Retrieved 31 March 2014. ^ "Romanticismo - Diccionario electrónico de la literatura colombiana". ihlc.udea.edu.co. 5 November 2007. http://ihlc.udea.edu.co/delc/index.php?tema=484&/Romanticismo. ^ "Costumbrismo - Diccionario electrónico de la literatura colombiana". ihlc.udea.edu.co. 5 November 2007. http://ihlc.udea.edu.co/delc/index.php?tema=477&/Costumbrismo. ^ "Colombian Academy of Language" (in Spanish). colombiaaprende.edu.co. http://www.colombiaaprende.edu.co/html/home/1592/article-130142.html. Retrieved 9 October 2013. ^ "Obeso: Poet of the Magdalena". thecitypaperbogota.com. http://thecitypaperbogota.com/culture/obeso-poet-of-the-magdalena/. Retrieved 9 March 2014. ^ Lucía Ortiz (2007) (in Spanish). "Chambacú, la historia la escribes tú": ensayos sobre cultura afrocolombiana (Candelario Obeso). IBEROAMERICANA. pp. 47–69. ISBN 9788484892663. http://books.google.com.co/books?id=VlfcbtH9EY4C&lpg=PP1&hl=es&pg=PP1#v=onepage&q&f=false. ^ "Artículo: Piedra y Cielo a contraluz" (in Spanish). Lablaa.org. http://www.lablaa.org/blaavirtual/publicacionesbanrep/boletin/bole69/bolet1a.htm. Retrieved 2013-02-18. ^ "Biblioteca Luis Ángel Arango" (in Spanish). Lablaa.org. http://www.lablaa.org/blaavirtual/publicacionesbanrep/boletin/boleti5/bol33/nadais10.htm. Retrieved 2013-02-18. ^ "Biography of German Castro Caycedo" (in Spanish). banrepcultural.org. http://www.banrepcultural.org/blaavirtual/literatura/gercastro/biografia.htm. Retrieved 9 October 2013. ^ a b c d "Colombian Art". donquijote.org. http://www.donquijote.org/culture/colombia/art/. Retrieved 22 August 2013. ^ "Tumaco: People and Gold on the Pacific Coast". banrepcultural.org. http://www.banrepcultural.org/gold-museum/tumaco. Retrieved 22 August 2013. ^ "San Agustín Archaeological Park". unesco.org. http://whc.unesco.org/en/list/744. Retrieved 22 August 2013. ^ "Rayo Museum" (in Spanish). museorayo.co. http://www.museorayo.co/. Retrieved 9 October 2013. ^ "Colombian sculptors" (in Spanish). colombia.com. http://www.colombia.com/cultura/resenas/escultura.asp. Retrieved 9 October 2013. ^ "Latin America’s largest antique negative archive in Medellín". colombiareports.co. http://colombiareports.co/latin-americas-largest-antique-negative-archive-medellins-public-library/. Retrieved 16 December 2013. ^ "Apuntes para una cronología de la fotografía en Antioquía" (in Spanish). http://biblioteca-virtual-antioquia.udea.edu.co/pdf/10/phot-mec-cfa.pdf. Retrieved 22 August 2013. ^ "Colombian music". about.com. http://latinmusic.about.com/od/countrie1/p/PRO04BASICS.htm. Retrieved 22 August 2013. ^ a b "Theater Festival". The Ibero-American Theater Festival of Bogotá. http://www.festivaldeteatro.com.co/. Retrieved 26 September 2013. ^ "Main performing arts festivals". iti-worldwide.org. Archived from the original on 2008-08-21. http://web.archive.org/web/20080821123228/http://www.iti-worldwide.org/amt/countries/p_COLOMBIA.html. Retrieved 9 October 2013. ^ "Theater of Colombia" (in Spanish). banrepcultural.org. http://www.banrepcultural.org/blaavirtual/historia/colhoy/colo11.htm. Retrieved 9 October 2013. ^ "Television in Colombia" (in Spanish). banrepcultural.org. http://www.banrepcultural.org/blaavirtual/exhibiciones/historia_tv/television_colombia.htm. Retrieved 9 October 2013. ^ "the Film Act passed in 2003" (in Spanish). secretariasenado.gov.co. http://www.secretariasenado.gov.co/senado/basedoc/ley/2003/ley_0814_2003.html. Retrieved 9 October 2013. ^ "Typical Colombian Food". http://www.southamerica.cl/Colombia/Food.htm. Retrieved 30 October 2013. ^ "Colombian Food: Variety, Tradition and Nature Fruits". going2colombia.com. http://www.going2colombia.com/colombian-food.html. Retrieved 30 October 2013. ^ "Colombian Food; A List of Traditional and Modern Colombian Recipes". southamericanfood.about.com. http://southamericanfood.about.com/od/exploresouthamericanfood/tp/Colombian-Food.htm. Retrieved 30 October 2013. ^ "Colombian desserts". uncovercolombia.wordpress.com. http://uncovercolombia.wordpress.com/2013/08/27/colombian-desserts-and-sweets/. Retrieved 30 October 2013. ^ "10 Colombian Drinks You Must Try Before You Leave". http://www.speakinglatino.com/10-drinks-you-must-try-before-leaving-colombia/. Retrieved 30 October 2013. ^ "Tejo – Colombia’s national sport". thecitypaperbogota.com. http://thecitypaperbogota.com/uncategorized/homepage-featured/tejo-most-muddy-sport/. Retrieved 28 August 2013. ^ "Patinaje colombiano, el más ganador del mundo" (in Spanish). elpais.com.co. http://www.elpais.com.co/elpais/deportes/noticias/patinaje-colombiano-ganador-mundo. Retrieved 9 October 2013. ^ "Historical moments of the Colombian cycling" (in Spanish). antena2.com.co. http://www.antena2.com.co/noticias/momentos-historicos-del-ciclismo-colombiano-69593. ^ "The 2010 SF N World Series Batting Log for Edgar Renteria". Retrosheet. http://www.retrosheet.org/boxesetc/2010/Irente0013352010.htm. Retrieved 21 March 2011. ^ "Recordando a nuestras glorias del béisbol" (in Spanish). eltiempo.com. http://www.eltiempo.com/blogs/playball/2010/03/recordando-a-nuestras-glorias.php. Retrieved 9 October 2013. ^ "History of boxing in Colombia" (in Spanish). boxeodecolombia.com. http://boxeodecolombia.com/historia-del-boxeo-en-colombia/. Retrieved 7 March 2014. ^ "Boxing champions" (in Spanish). boxeodecolombia.com. http://boxeodecolombia.com/nuestros-campeones/. Retrieved 7 March 2014. ^ "Ministra de Salud dice que la cobertura en este sector subió al 96%" (in Spanish). elpais.com.co. http://www.elpais.com.co/elpais/colombia/noticias/ministra-dice-cobertura-en-salud-fue-96. Retrieved 18 August 2013. ^ "Colombia Medical Tourism". mymedholiday.com. http://www.mymedholiday.com/country/colombia. Retrieved 8 March 2014. ^ "16 Colombian clinics among the best 40 in Latin America". proexport.com.co, America Economia magazine. http://www.proexport.com.co/en/health-colombia/health-turism-news/16-colombian-clinics-among-best-40-latin-america. Retrieved 22 August 2013. ^ "Ministerio de Educación de Colombia, Estructura del sistema educativo". 29 June 2007. http://web.archive.org/web/20070629194012/http://menweb.mineducacion.gov.co/nnormas/normas_basicas_4.swf. This page uses content from the English language Wikipedia. The original content was at Colombia. The list of authors can be seen in the page history. As with this Familypedia wiki, the content of Wikipedia is available under the Creative Commons License.